A lot can be said for the charms of country life, both the increased quiet time and decreased city commotion improve memory. That said, there’s usually only one stoplight, and the Motel 6 might only sleep six people. 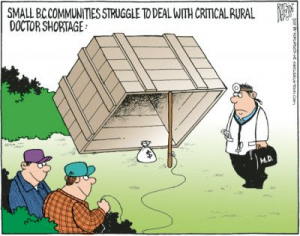 But as a healthcare professional, working in rural healthcare has several surprising benefits. The national demand for physical therapists is expected to see a 28% increase between 2016-2026. That’s 21% faster growth than the average occupation! The US Bureau of Labor Statistics ended their most recent report on physical therapists by saying, “Job prospects should be especially favorable in rural areas because many physical therapists live in highly populated urban and suburban areas.” The US Department of Health and Human Services, estimates there are currently 34% fewer physical therapists and 58% fewer physicians per patient in rural America. It’s estimated only 11% of graduating physicians look specifically for employment in rural areas. Similar distribution patterns can be seen in almost every health profession. 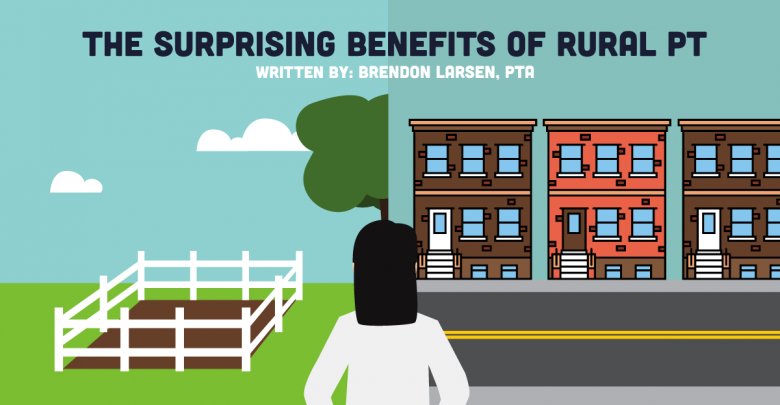 Interestingly, physical therapist assistants are one of the only providers to see a relative increase – 17% greater distribution in rural areas. Rural America’s need for physical therapists is further heightened by the fact that nearly one-in-five rural Americans are over 65 years old. Decreased supply and ever-increasing demand will lead to better salaries and job security. While rural Americans earn less than their urban counterparts (average annual income is $9,242 lower than urban income in the US) rural healthcare professionals do not. Nationally, rural physicians can actually expect to earn 16% more than their urban counterparts and 10% more than physicians in suburban areas. Non-metropolitan areas offer higher pay for physical therapists as well. 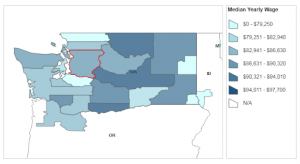 Below are two maps of Washington State with a side-by-side comparison of population density and median wage. Notice that the three highest paying regions are all rural, each earning $8,000+ more annually than the average therapist in Seattle (King County). Maybe that might be enough to make up for missing out on the Original Starbucks? ( Full disclosure, some of these small communities may not have any Starbucks. I have it under good reference that Okanogan is so small that the McDonalds has only one arch). This data repeats on the national level, with five of the eight highest paying regions in the United States being non-metropolitan. If knowing that the average Seattle PT will make $250,000 less over a 30-year career isn’t upsetting enough, the fact that Seattle clinched bronze for the highest rental prices in the US may worsen the news. However, despite its lofty status, Seattle isn’t alone. In urban areas across the United States, rent is higher and home-ownership rates are lower. Urban residents even pay more taxes than their rural counterparts. Urban Pennsylvanians, for example, pay more for each of the primary categories when calculating the cost of living: groceries, transportation, healthcare, housing, utilities, and miscellaneous goods. With financial circumstances being the number one cause of stress for 47% of millennials, it only makes sense to consider living in a more rural community. Expanding your roles will allow you to more likely than any other healthcare provider to transition from urban to rural healthcare during their career. George Burns stated, “Happiness is having a large, loving, caring, close-knit family in another city.” Whether you want to increase earning potential, change your scenery, or just get away from your cheek-pinching aunt, rural healthcare may be an excellent fit. Chipp C.; Dewane S.; Brems C.; Johnson ME; Warner TD; Roberts LW; “If Only Someone Had Told Me…”: Lessons From Rural Providers. The Journal of rural health : official journal of the American Rural Health Association and the National Rural Health Care Association. 2011;27(1):122-130. doi:10.1111/j.1748-0361.2010.00314.x.